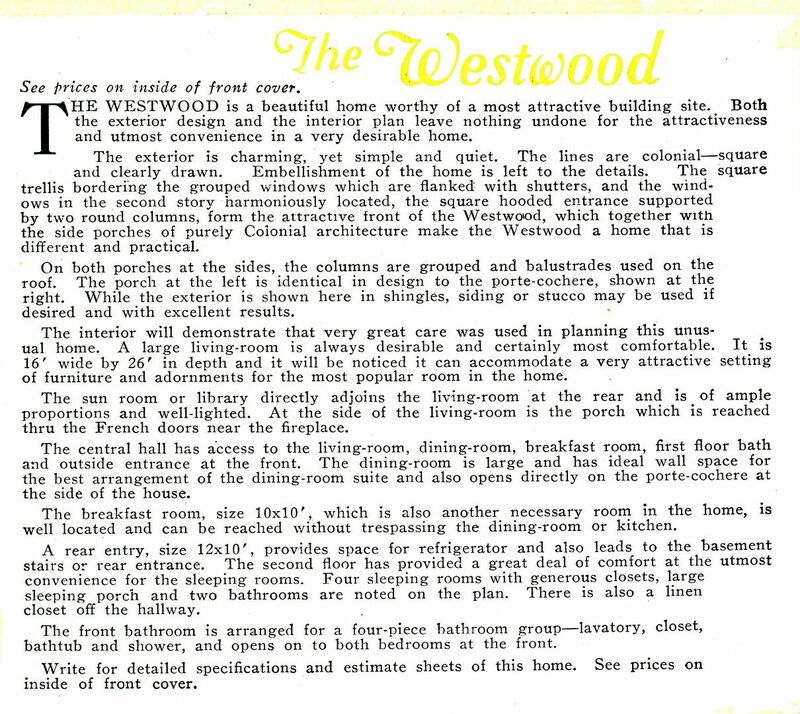 The Aladdin Westwood was offered only in the 1922 catalog, which is curious. It’s a beautiful house and quite massive, but apparently the Sovereign brothers decided it wasn’t a keeper. In September 2013, I gave a talk in nearby Louisa, Virginia and drove over to Charlottesville to see what was lurking in Hoo-ville. What a sweet surprise to find an Aladdin Westwood at the end of a quiet residential street! I was with a local historian and we knocked on the doors repeatedly but no one showed up. It’s been two years since I was there. Hope this house survives! These big Aladdin houses don’t do well in college towns. 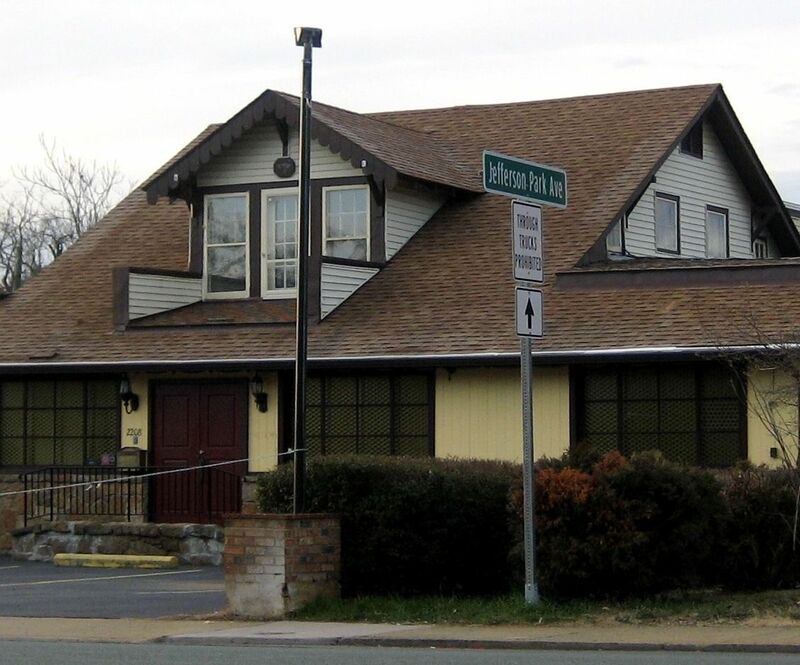 In nearby Williamsburg, Virginia, an Aladdin Colonial was torn down on the William and Mary campus (about 15 years ago). 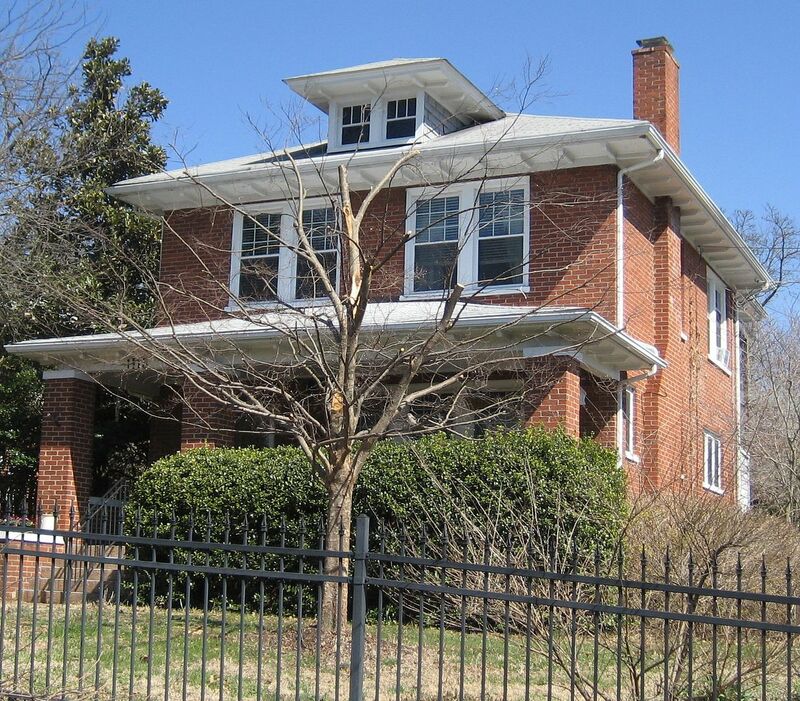 To read about the other kit homes I found in Charlottesville, click here. 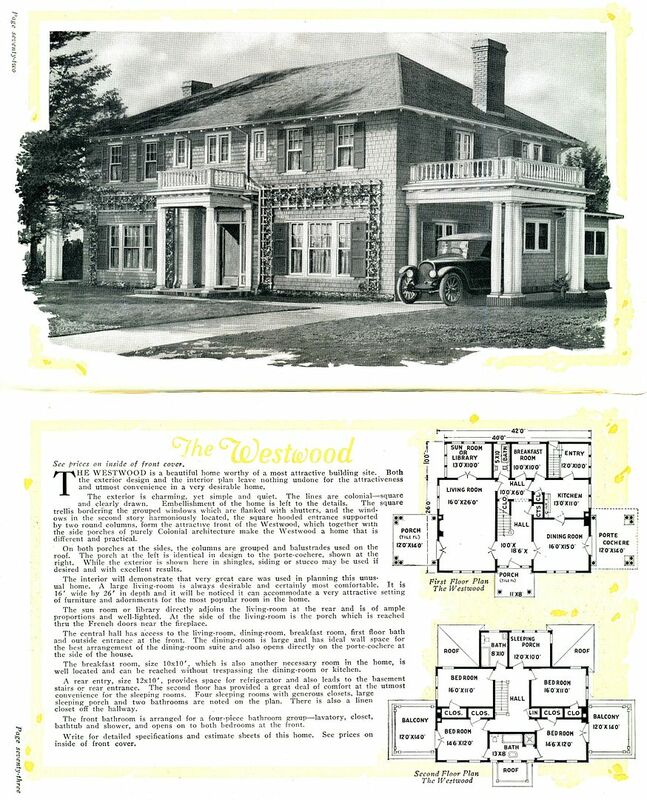 The Aladdin Westwood was offered only in the 1922 catalog. 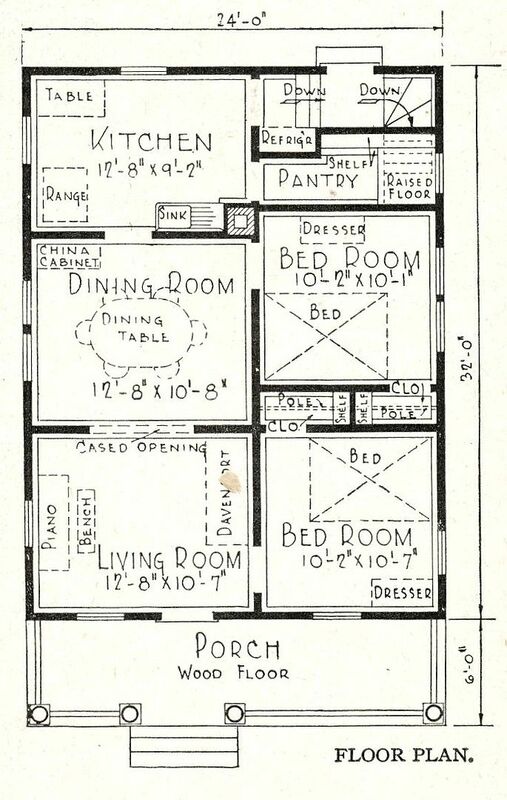 One of the best parts of playing with kit homes is studying the old floor plans. I just love looking at these old images, and thinking about day-to-day life in early 20th Century America. The house was about 3,000 square feet - which isn't typical for a kit home! 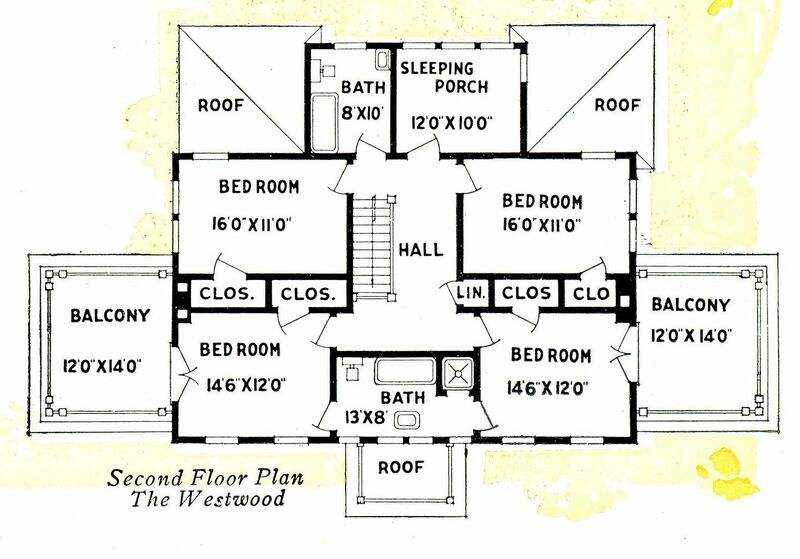 And there's a half-bath on the first floor (1922). Sounds fancy, too! 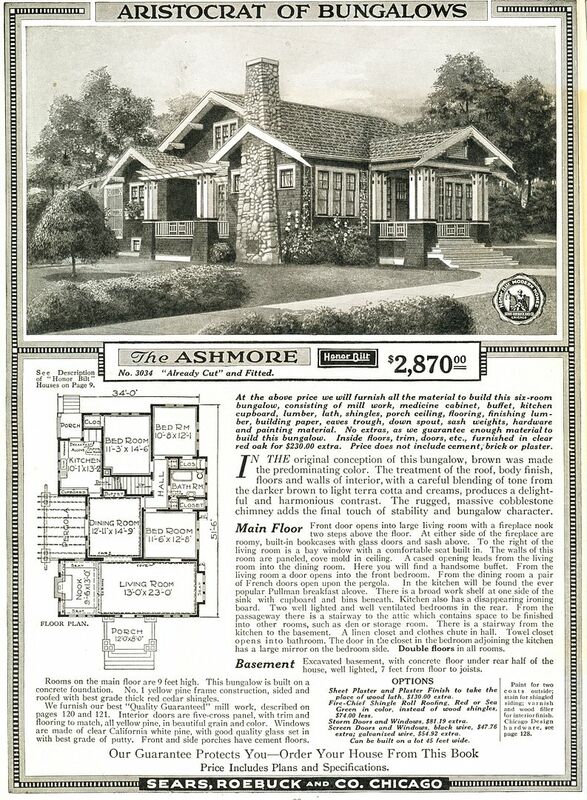 And it mentions that shower on the "front bathroom" (1922). 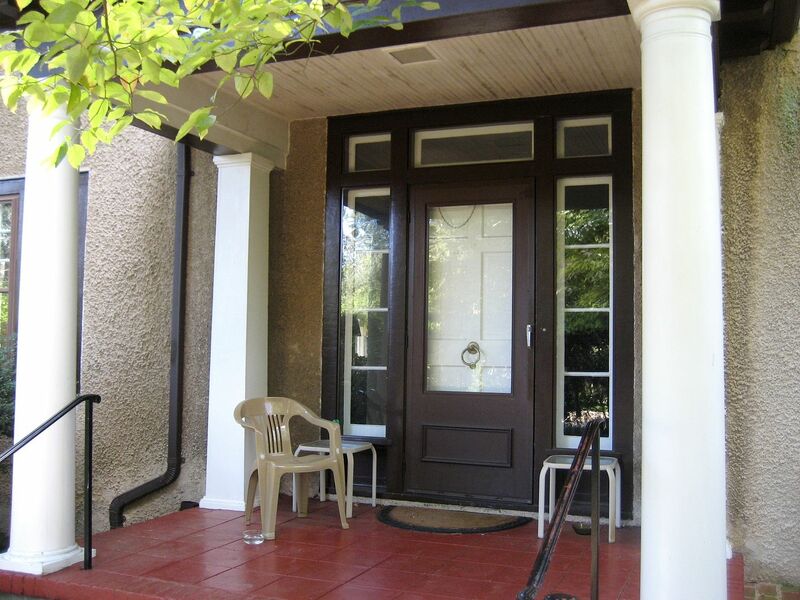 And check out that front door! I was pretty tickled to find this sweet thing in Charlottesville. To date, it's the only Westwood I've ever seen. And check out the detail around that front door. I tried desperately to get a long shot of the house and show that hipped roof, but landscaping prevented it. If you look down the side, you can see it's a good match, all the windows are in the right places. It's surprising to see that the columns are still in such good shape. They're almost 100 years old now. The Aladdin Westwood looks like the Aladdin Villa in many ways. 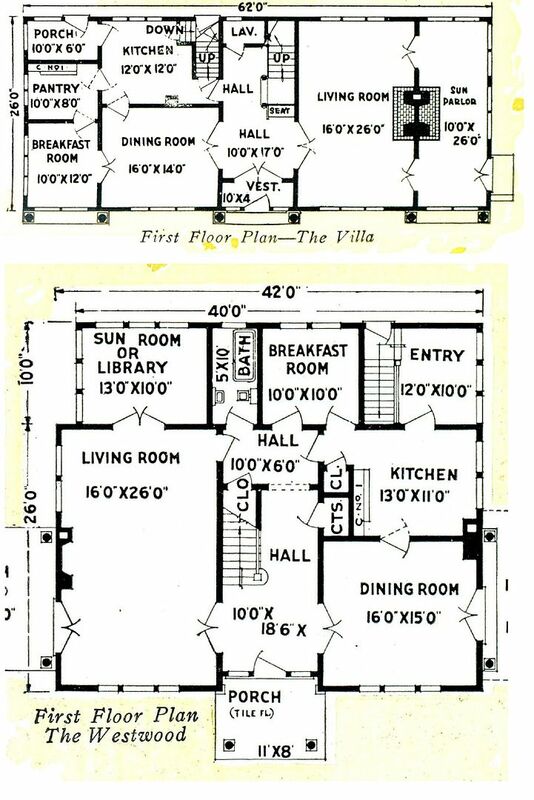 But the footprint and floorplan are radically different. It's sad to see that the house has been turned into a duplex, but I suppose we should rejoice that - living in a college town - it still survives. 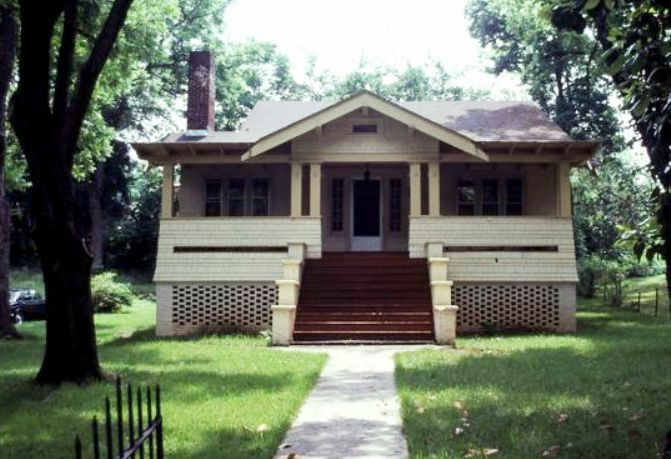 College towns are notorious "bungalow eaters." 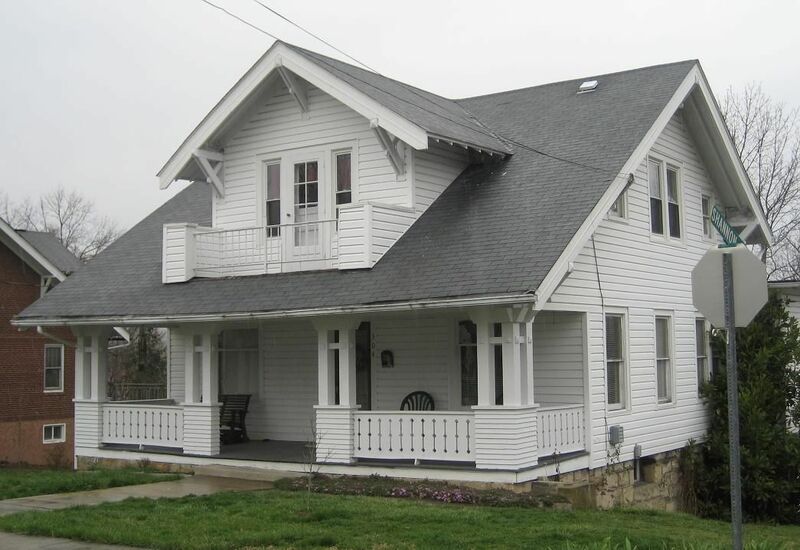 Here are some images of the kit homes in Louisa, Virginia. On March 23, 2013, I traveled from Norfolk to Charlottesville to take my ham radio test (and I passed!). Along the way, I stopped at Mineral, Gordonsville and Louisa to look for kit homes. 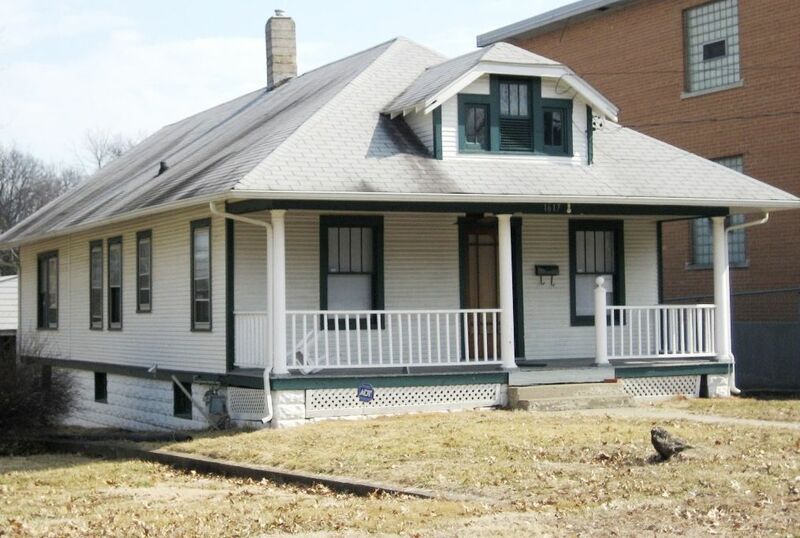 The best part of finding and documenting these old kit homes is that more than 3/4ths of the people living in these historically significant kit homes did not realize what they had until they discovered that information here at my website (and/or received a note from me). 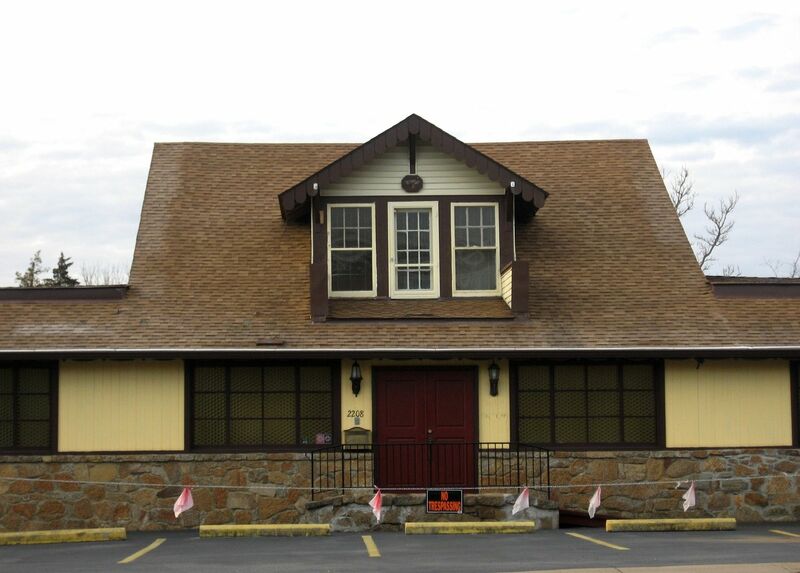 This is a piece of America’s architectural past that’s at risk of being lost to the ages. Click here to learn more about how to determine if you have a kit home. First, the good. 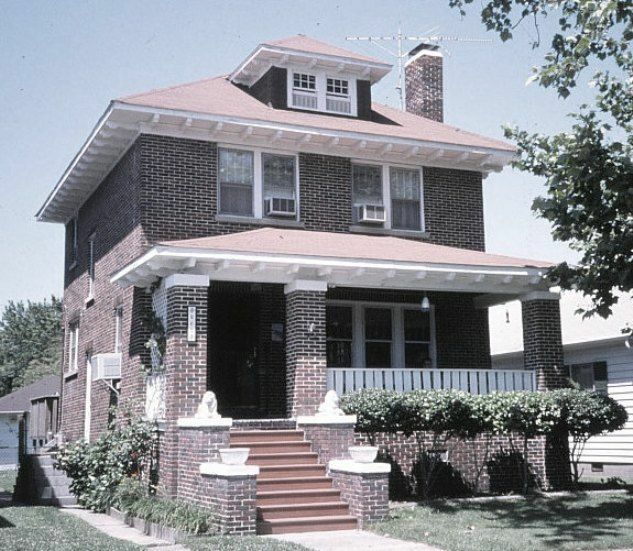 The Sears Glen Falls was a beautiful Dutch Colonial and spacious, too (1928). 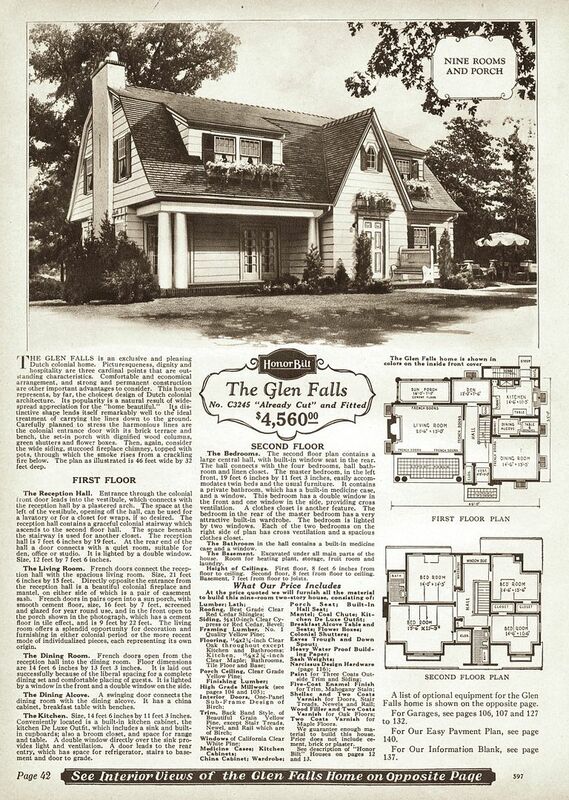 At 2,900 square feet, the Glen Falls was just a little smaller than the biggest Sears House of them all - The Magnolia. 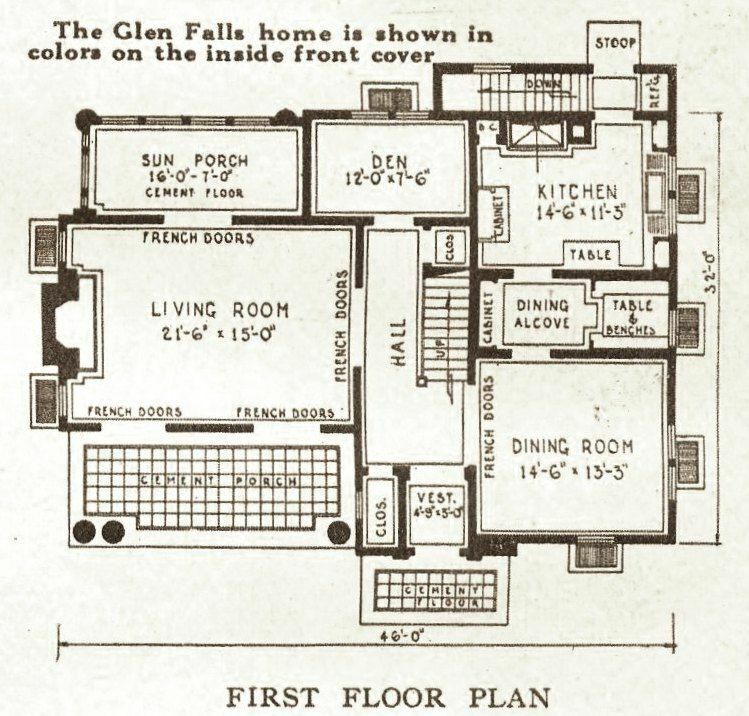 The Glen Falls was also the second most expensive house that Sears offered (The Magnolia being the most expensive). Notice the butler's pantry (between the dining room and the kitchen). 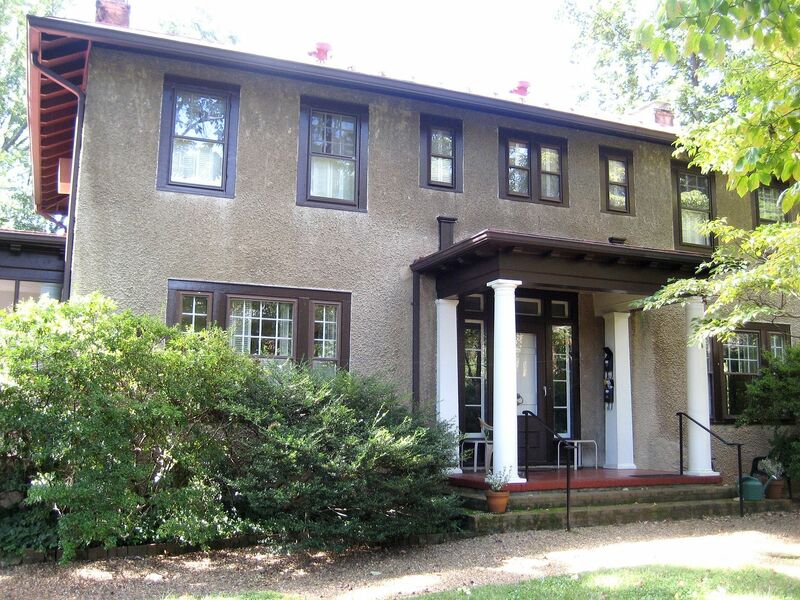 These were unusual features for an early 1920s kit home. Is this a Sears Glen Falls? With the paired french doors, it sure looks like s a good match, but I'd need to know the home's exterior footprint to authenticate it. And on to the grand! This is a Sears Rockford, one of Sears finer homes. This majestic foursquare was offered only in brick. 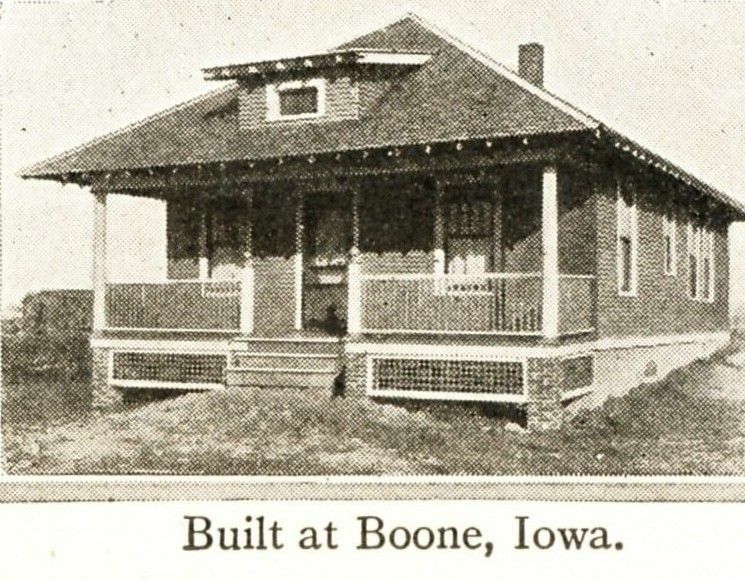 It's shown here in the 1928 catalog. I've only seen three other Rockfords and all three of them were in Virginia. 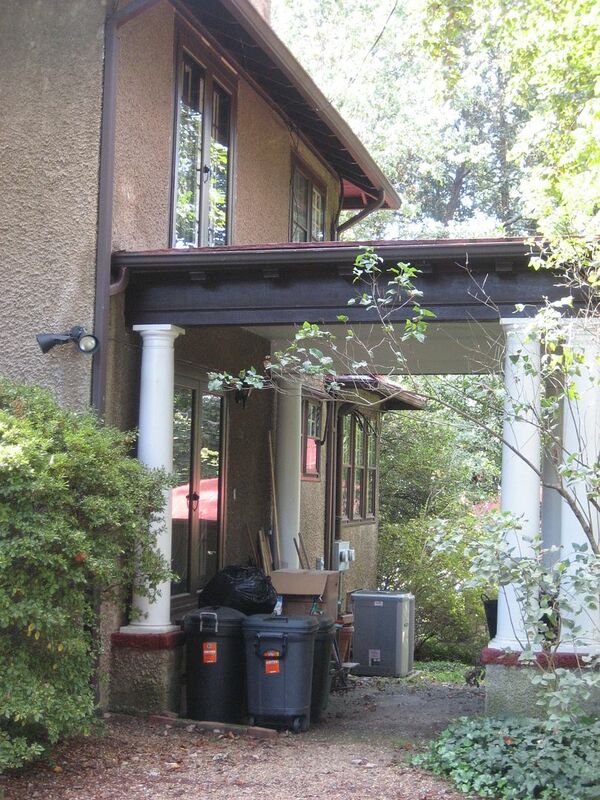 Notice the detail on the columns, and the eave brackets. Also notice the window arrangement. And here's a picture-perfect Rockford in Charlottesville. What a grand find! Do the owners know it's a Sears Rockford? I'd love to know. Oh my, what a lovely match! The astute observer might notice that the dormer on the Charlottesville Rockford is just not a perfect match to the original catalog image. 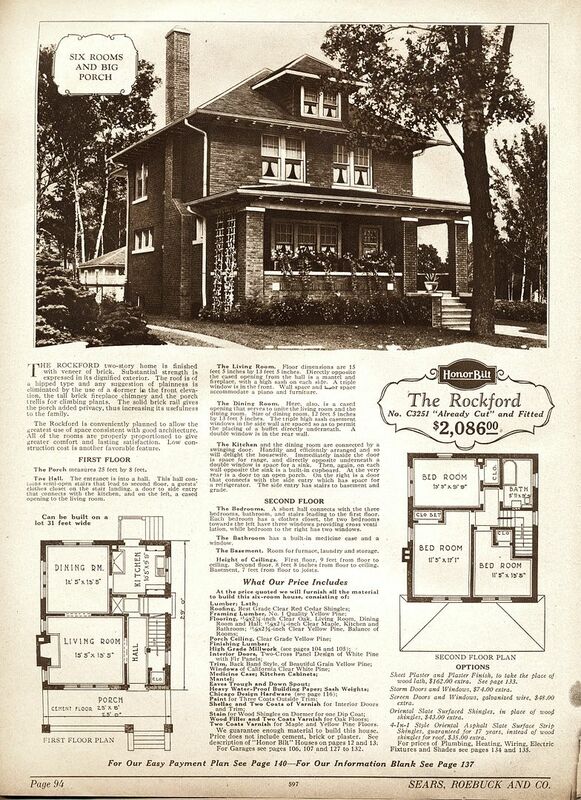 I've seen three Rockfords (all in Virginia) and each of these Rockford had a much smaller dormer than is depicted in the catalog's line drawing. 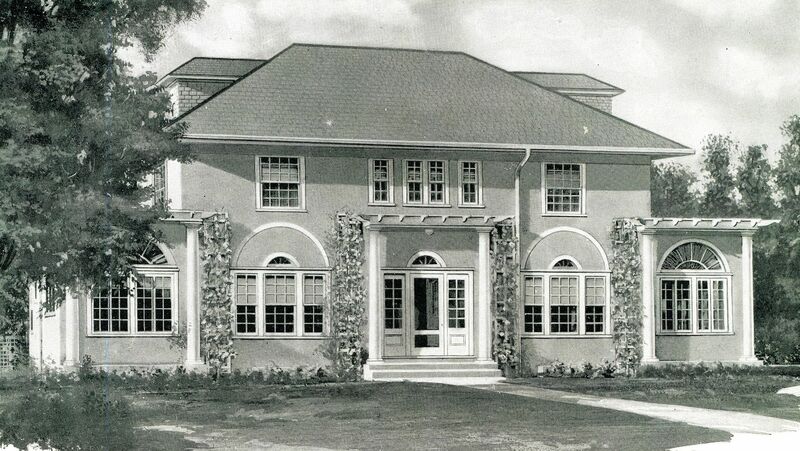 Shown above is the Rockford in Cape Charles, Virginia. Thanks to K. Edward Lay, I've learned that there's a Sears Ashmore in Charlottesville. 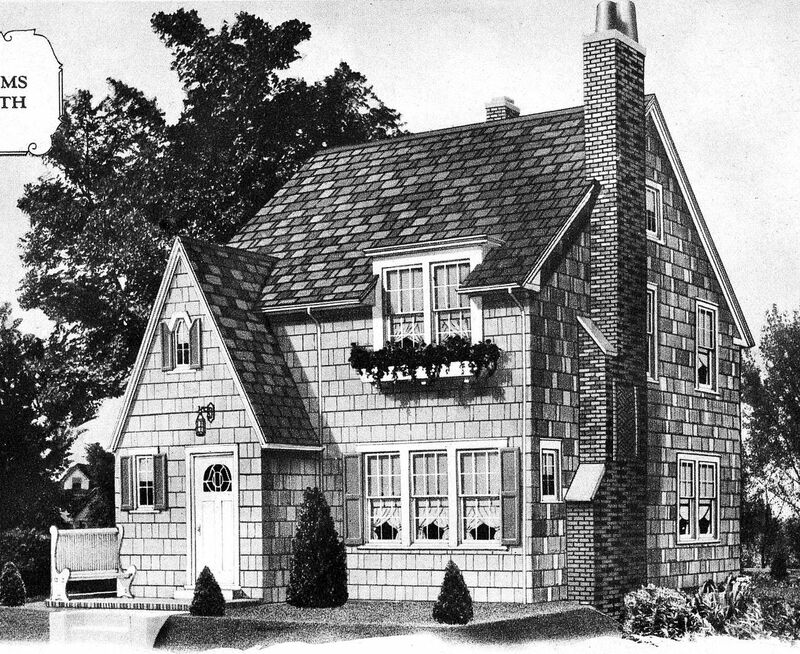 This was a classic Arts and Crafts bungalow (as seen in the 1919 Sears Modern Homes catalog). 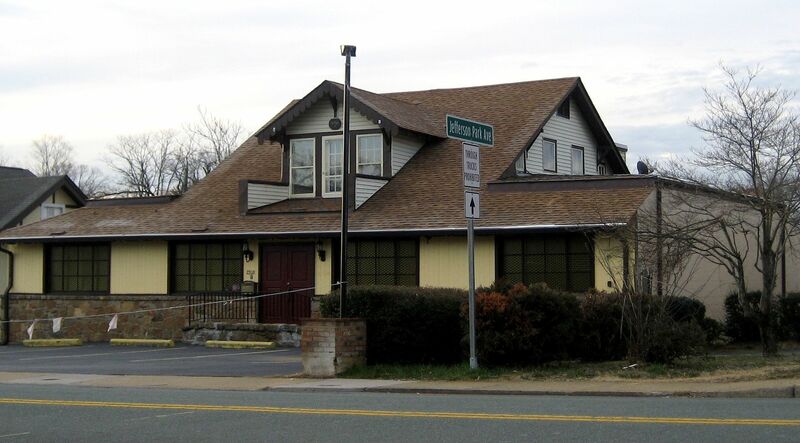 Also thanks to K. Edward Lay, I now have a photo of the Ashmore in Charlottesville! And it's the "Aristocrat of bungalows!" Photo is credit is K. Edward Lay, The Architecture of Jefferson Country, CD-Rom, 2001. 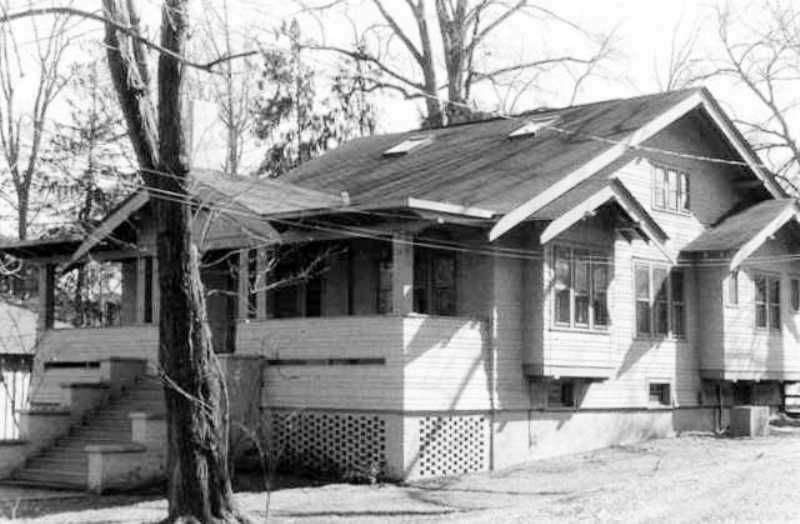 Another view of the "Aristocratic Bungalow" in Charlottesville, VA. Photo is credit is K. Edward Lay, The Architecture of Jefferson Country, CD-Rom, 2001. Before we get to the "ugly," let's talk about the mysterious. 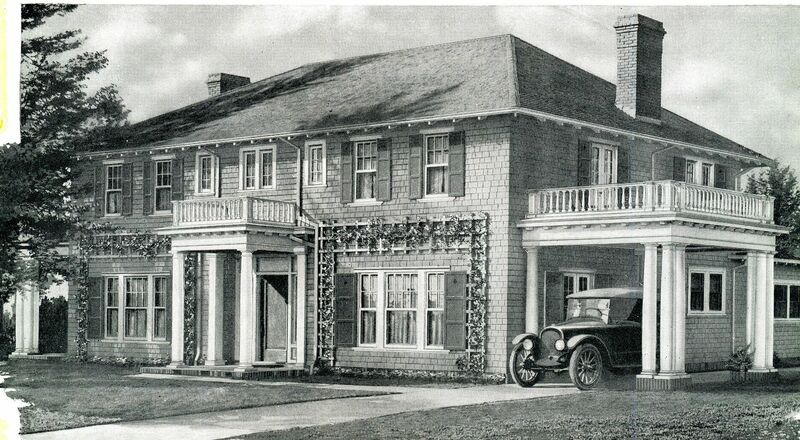 This is a Sears Barrington, a hugely popular house for Sears (1928 catalog). 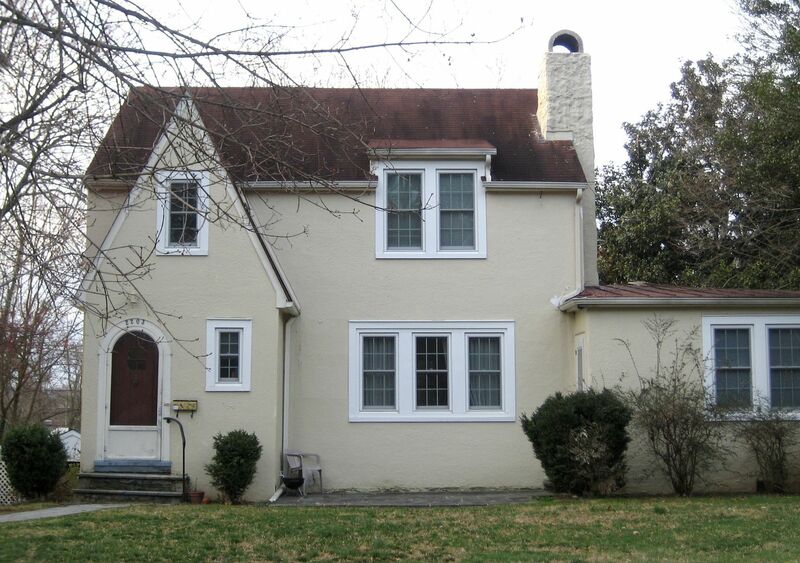 Notice the cornice dormer, the front-gabled foyer and the darling little windows within that gable. And here's where it gets mysterious. Is this a Sears Barrington in Charlottesville? It sure looks like it could be. Oooh, but wait, look at the half-round door! And the darling little window is squared, not angled (as is shown in the image above). And there's no light over the door. Hmmm. So, maybe it's not a Sears Barrington? Tough to know for sure. It's another house that bears more investigation. Here in Virginia, I've found that the majority of our kit homes came from Aladdin Kit Homes (Bay City, MI). Aladdin was actually a bigger company than Sears, and Aladdin had a mill in Wilmington, NC. 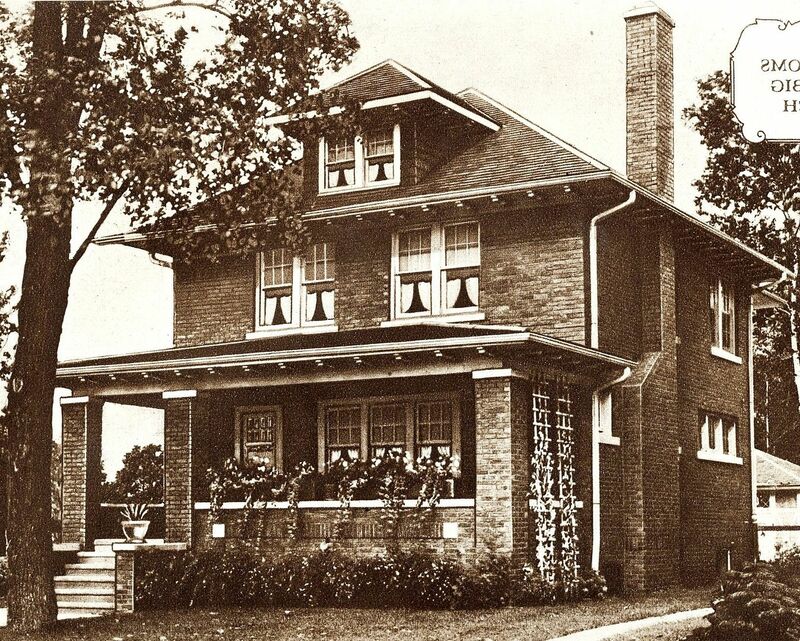 Sears sold about 70,000 kit homes in the early 20th Century, while Aladdin sold more than 75,000 houses. Shown here is an Aladdin Newcastle, which looks a lot like a Sears Barrington, except, the Newcastle does have that rounded entry door, and there's no light over the door. However, the darling little windows are still not quite right. So is it an Aladdin Newcastle or a Sears Barrington? I don't know. I'd love to get inside the house and look at the framing members. You can learn a lot by looking at framing members. 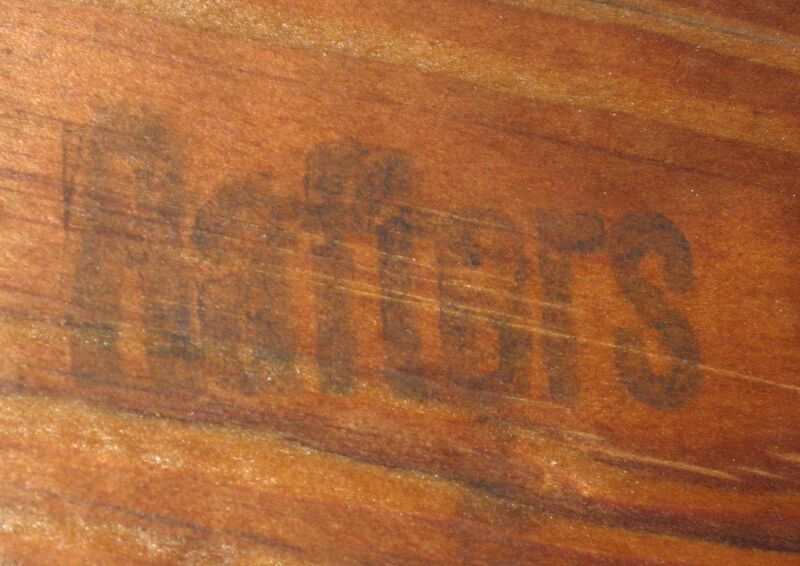 For instance, if it has a mark like this, it's a Sears kit home. This mark, together with a 75-page instruction book, told the novice homebuilder how all those 12,000 pieces and parts went together. If it has a mark like this, it's an Aladdin. The Sears Westly was surely one of their most popular designs, and was proably one of their top ten best-selling models. 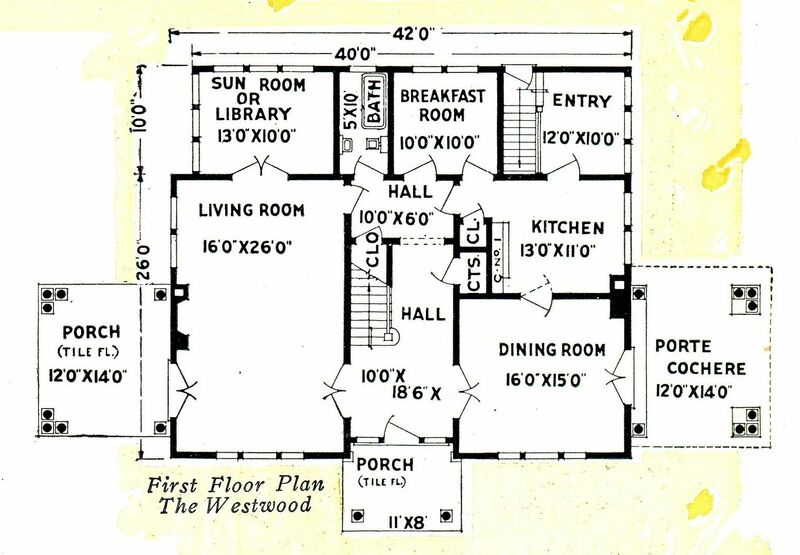 It's a very cute house and has a good floor plan. However, sometimes bad things happen to good Westlys. 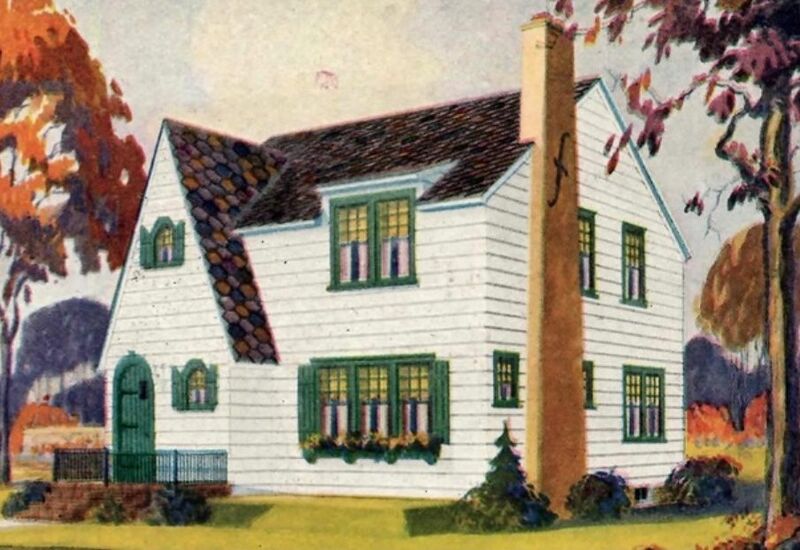 Image is from 1916 Sears catalog. Before we hit the ugly, here's a happy, happy Westly in Oakhill, West Virginia. What a fine little Westly it is. And it's in original condition, too. Not bad for a 90-year-old home. Oh dear. Oh dear, dear, dear. Oh my, is this really a Westly? I fear that it is. In fact, I'm 98.765% certain that it is. I've seen at least 200 Westlys and this has the right proportions (minus the not-so-sensitive remodeling). Poor little Westly. There's so much that's wrong with this house. 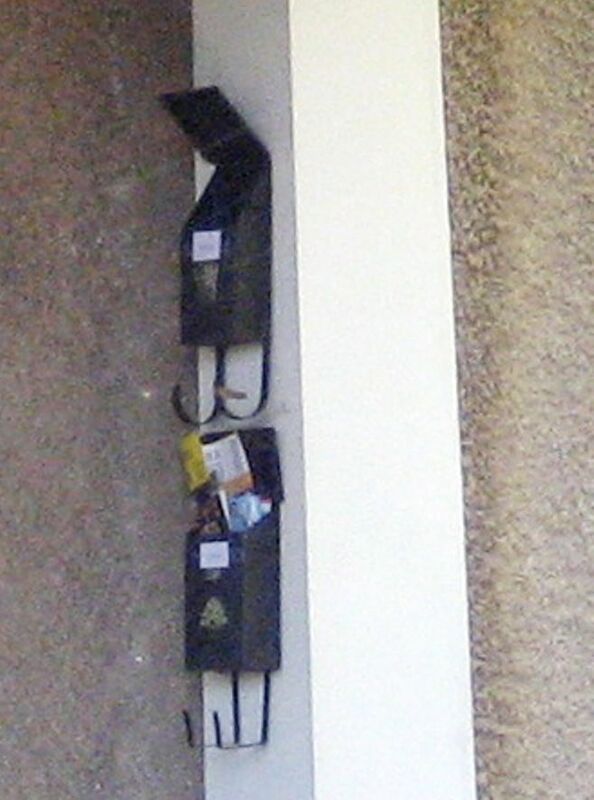 It's kind of an anachronism of bad remodeling practices through the decades. From the T-111 siding on the exterior to the 1980s picture windows to the fake stone facade to the mismatched lanterns on the home's front, this poor house has suffered pretty much every architectural indignity imaginable. Whew. That was rough. Back to the good. 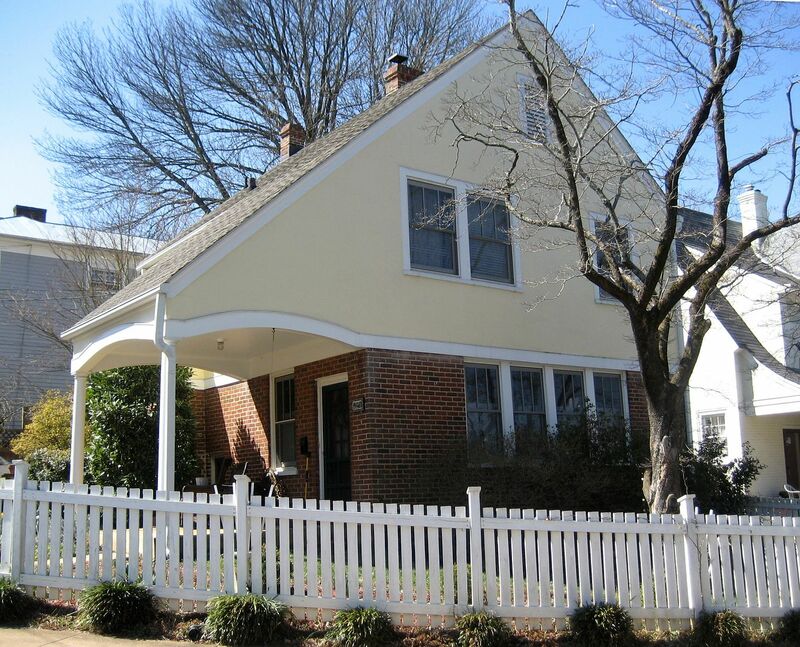 In addition to the kit homes, Charlottesville also has a few "Plan Book" houses. These were different from kit homes. 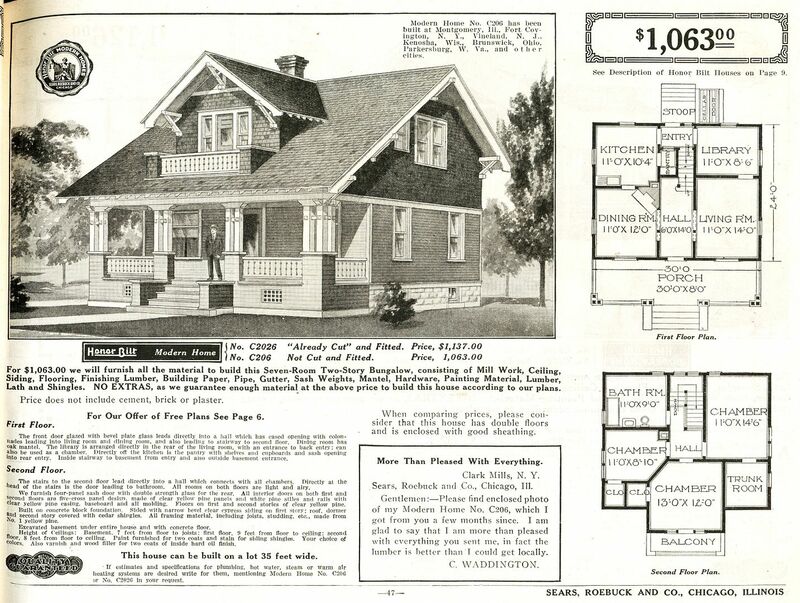 With plan books, you'd browse the pages of the catalog and pick out a house and send off for the blueprints. A complete inventory of all building materials that you'd need came with the deal. The lumber and hardware could then be purchased locally. 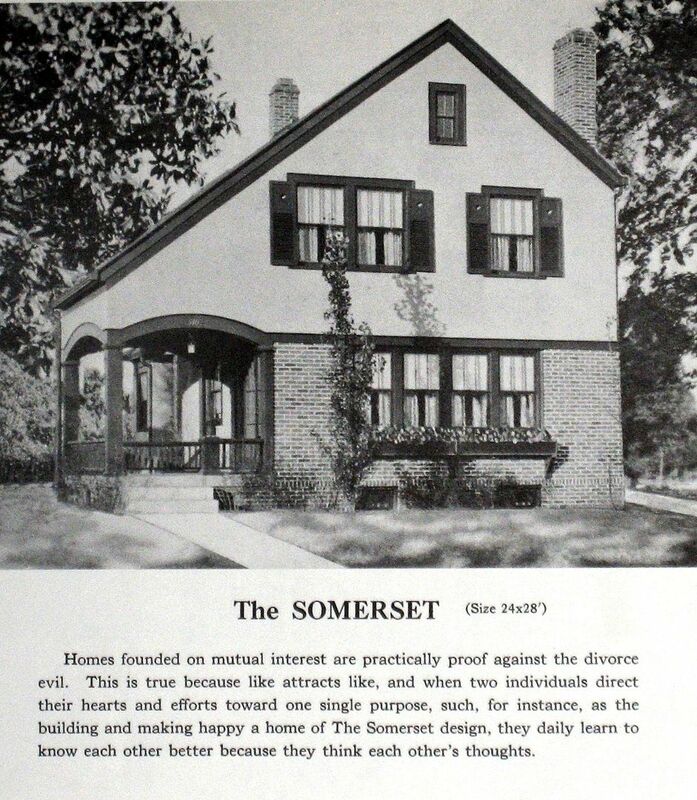 Shown above is a plan book house, "The Somerset." And Charlottesville has two of them! 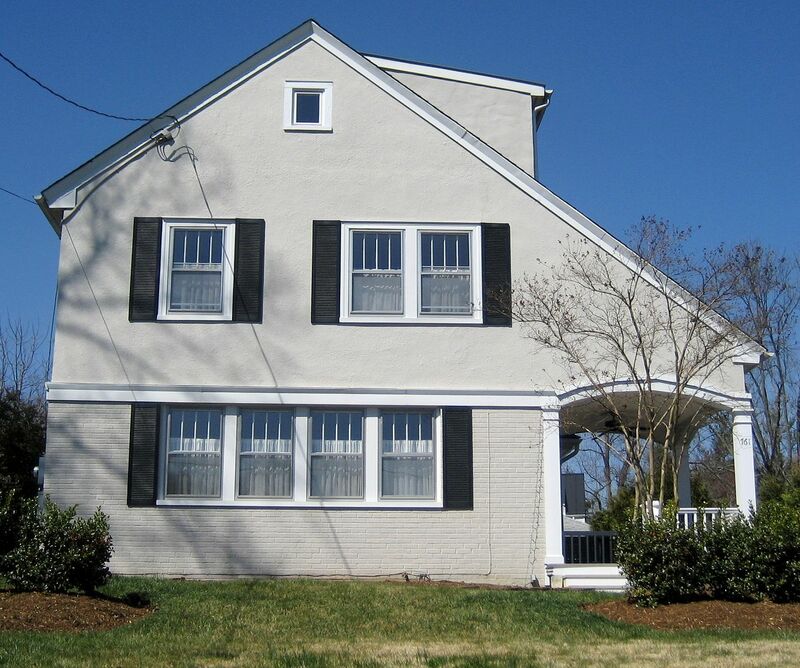 Do you know of a kit home in Charlottesville? Please leave a comment below and Rose will respond as soon as possible. 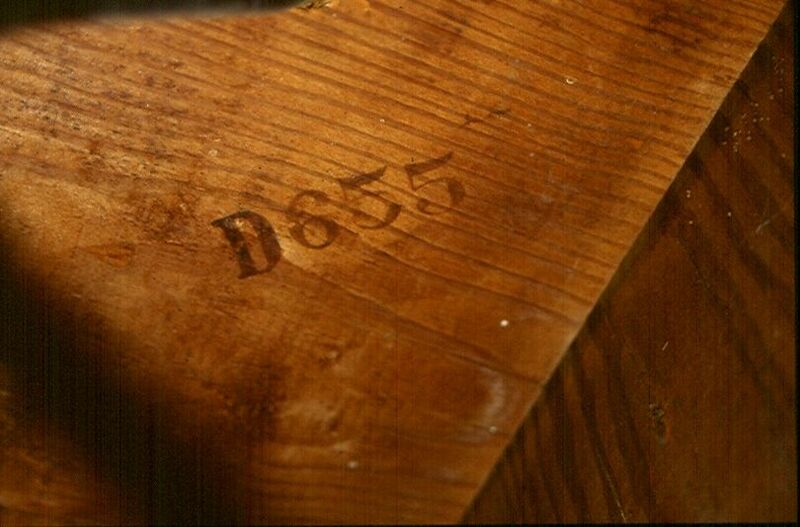 To learn more about how to identify a house based on the lumber markings, click here. 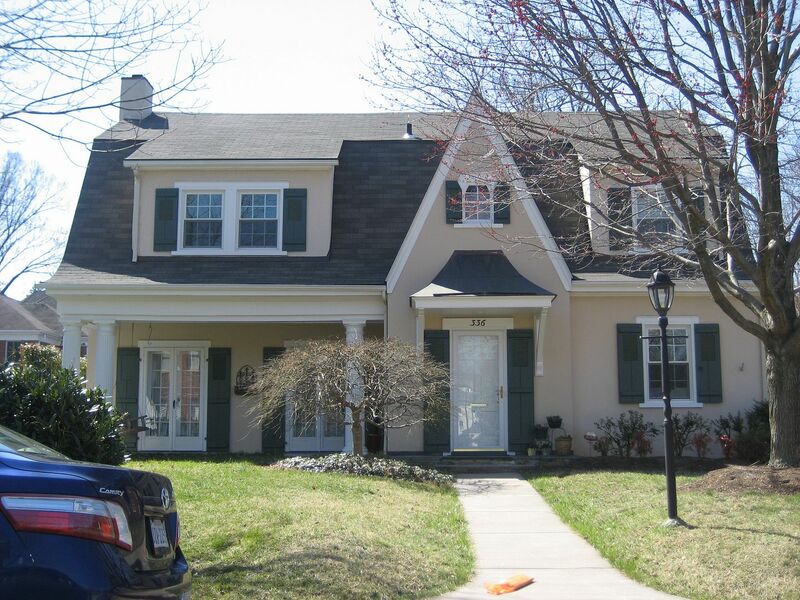 To read about the delightful collection of kit homes in Staunton, click here. In the early 1910s, it’s probable that the Sears Starlight was their most popular model. In the early days, it was offered with and without an indoor bathroom. In 1921, the Starlight had a significant model change. The small shed dormer in the attic was enlarged and changed to a hipped dormer with three windows. In addition, the pitch of the attic was made more steep, creating space for an additional room (for short people with a good tolerance of summertime heat). Click here to learn more about Sears Homes. 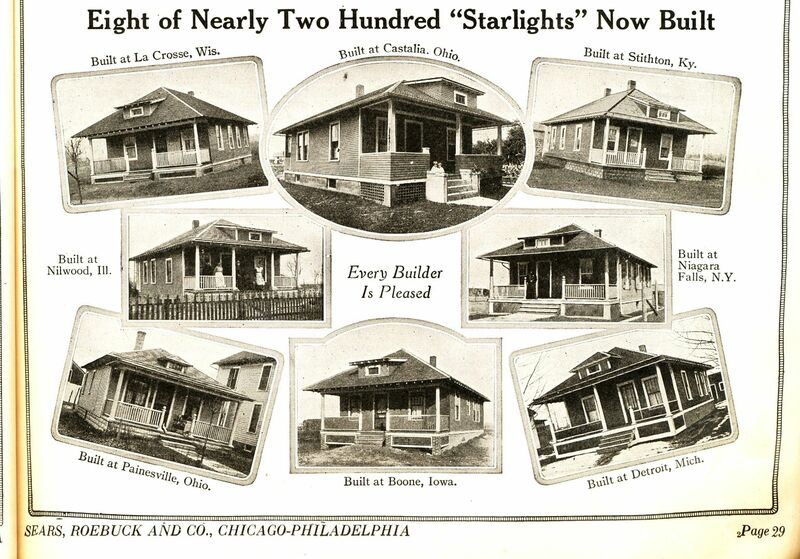 This little ad appeared in the the 1919 catalog, showing the many sizes and shapes of the Sears Starlight. This shows the houses with a myriad of dormers! 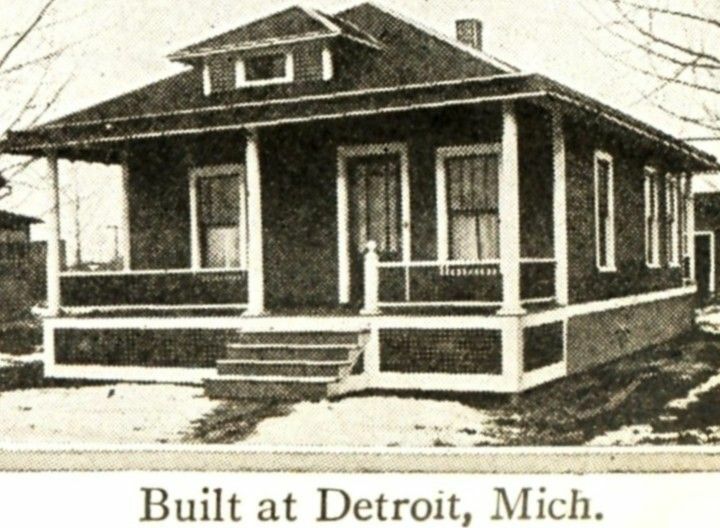 In 1920, the Starlight had the shed dormer (some of the time). This Starlight in Boone, Iowa has a traditional shed dormer. 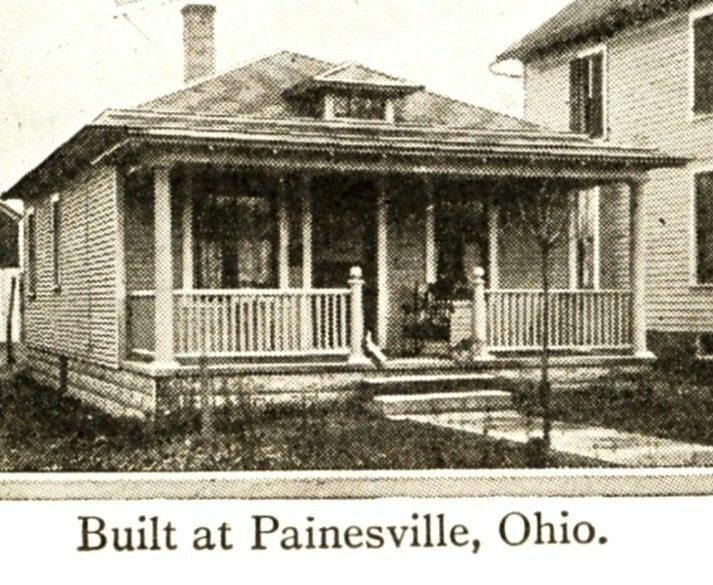 But look at the dormer on this little Starlight in Painesville. It's a gabled dormer and it's really, really tiny. 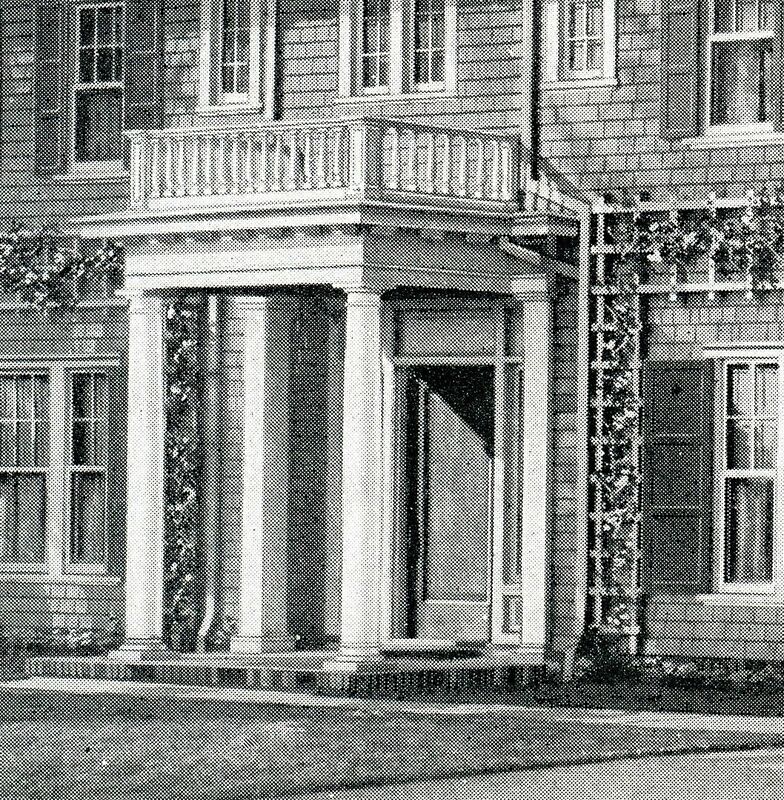 And the front porch roof is flat, and it's not an integral part of the house, as it is with the traditional Starlight. How confusing!! 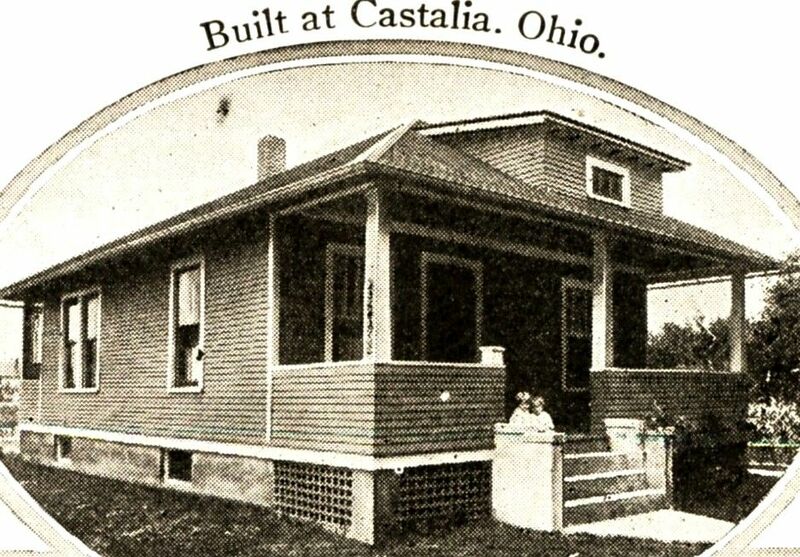 Built in Castalia, Ohio, this Starlight has a different railing, and I have no idea what the floor plan is, because those windows down the side are in the wrong place. Again, the railing is different and this one has a hipped dormer (rather than shed) and this appears to be a bathroom-less model. 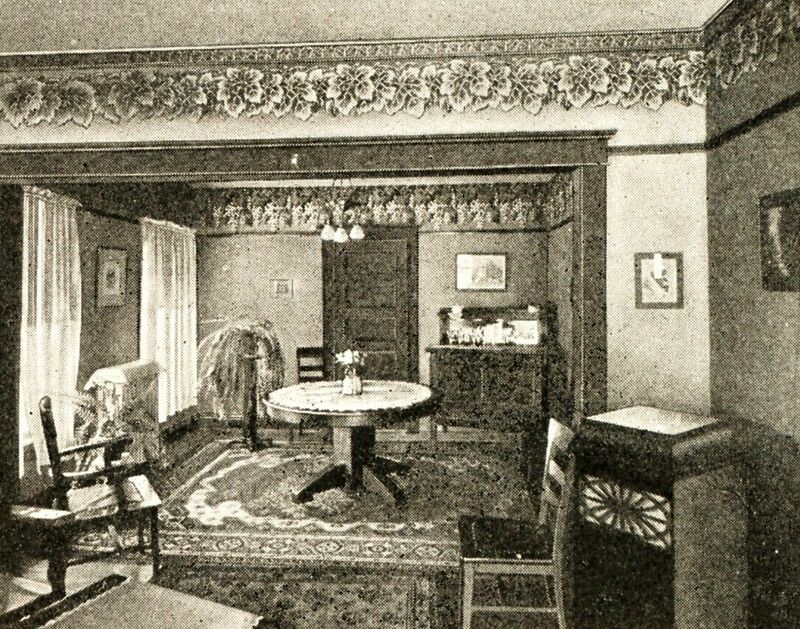 In the 1921 catalog, these interior photos were featured. 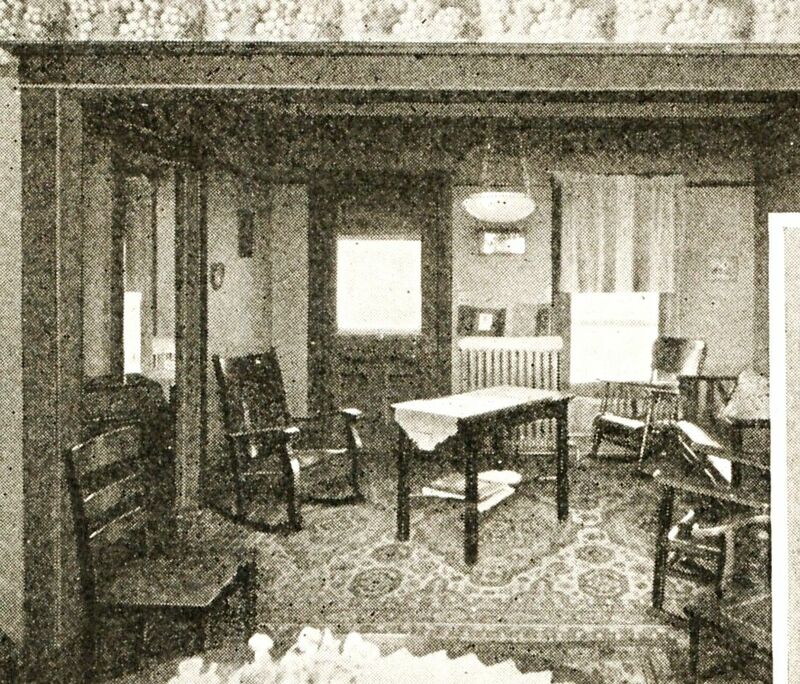 A view of the Starlight's dining room (1921 catalog). 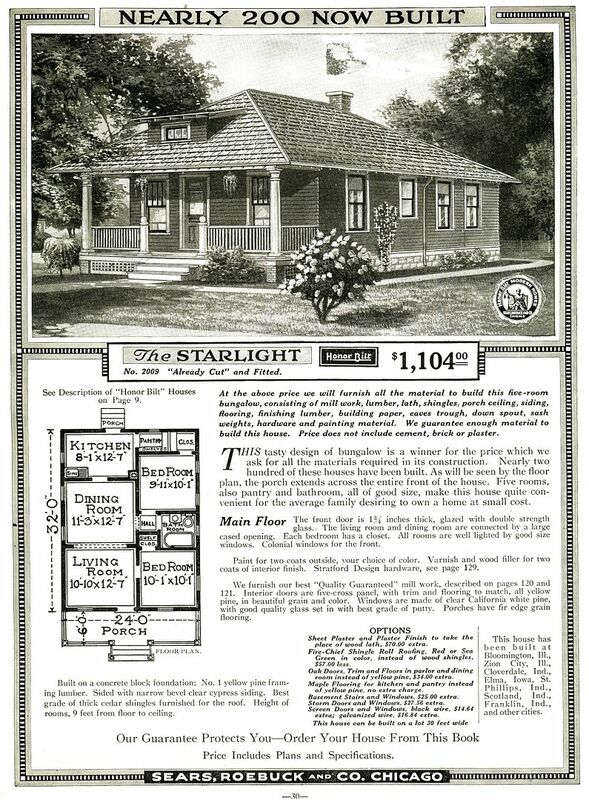 The bathroom-less Starlight was offered into the 1920s. 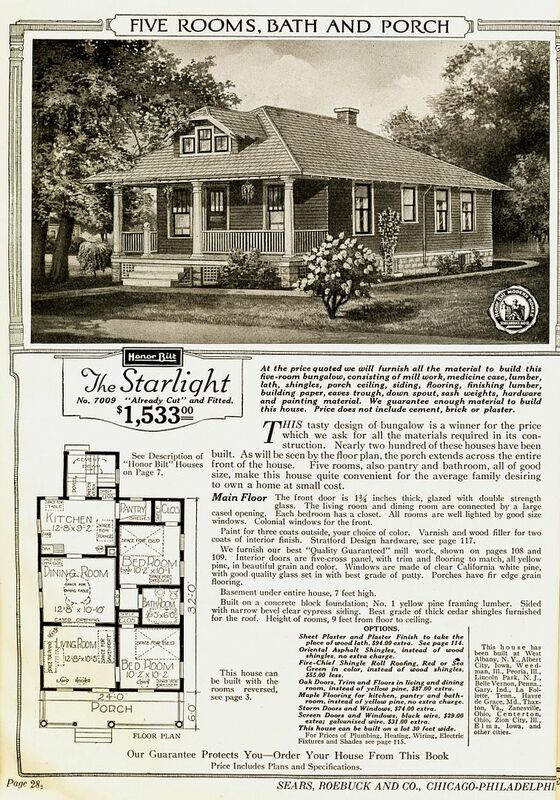 In1921, the Starlight sold for $1,553. Sears Starlight in Alton, Illinois. 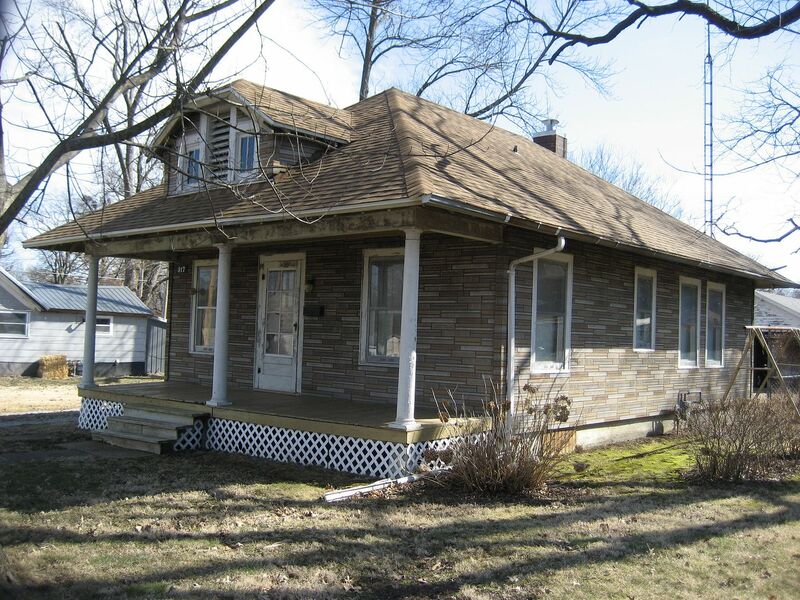 This Starlight in Duquoin, IL is in mostly original condition. To learn about Wardway Homes, click here.